Stop listening to bogus "diet" claims. Take charge of your health and life and help reverse global warming, reduce starvation, and end animal abuse. Which is it... Low-carb? High-fiber? Low-fat? Cut the skin off chicken and avoid red meat? Dairy products help you lose weight? Dairy products make you gain weight? How can it possibly be so complicated?! Enough already with all the confusing, contradictory advice on nutrition! There is a simple answer to your dietary concerns, an answer that will help you avoid seemingly inevitable diseases that are in your family. You don't have to accept heart disease, cancer, diabetes, or Alzheimer's disease as a part of growing old. 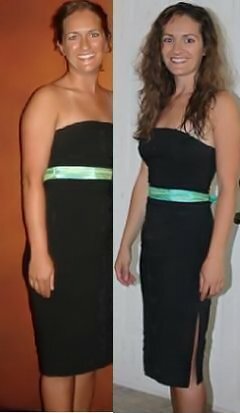 An answer that will help you lose any unnecessary weight and will make you feel alive and full of energy. You can finally feel free to do anything you want to in life, whether it be sky-diving over the ocean, biking around wine country, hiking the Appalachian trail, or even just playing with your kids. You don't need to be controlled by medicine and weighed down by extra body fat. It may seem crazy to think that there is one final answer to your problems. It may even seem like another lose-weight-fast diet fad. But it's not. It's simple. In addition to helping your physical body, you also have the power to change the world around you, all by making smart choices in your diet. You alone can help end global pandemics, and can change global cimate change. You can help people who are starving across the world, and you can save animals suffering needless abuse. I really enjoyed reading the book, it's clear, concise, and full of very helpful tips, advice and facts. I've been a vegan for several months, and I was able to learn a lot from it! I think it will be a great book for those who are just starting or who are interested in going vegan. It is always good to have another resource and tool when being vegan, and I will definitely be referencing "A Fresh New Vegan You" as I continue on this life changing, world changing path that I am on. Going vegan not only saved my life, but it changed the way I look at the world, and the life that is in it, it helped me to see all the beauty that is in this world, and how much I wanted to work to preserve it. Before going on a plant based diet there was so much that I was missing, but now, almost a year later, I am feeling better than I ever have, I'm continuing to lose weight, and I continue to have controlled diabetes without medication. Why don't you know this already? It's frustrating, but the reason everyone doesn't know about this simple solution revolves around money. It's simply more profitable to keep people unaware of how to take control of their own lives. Diet companies make money by helping people lose a little weight, but not enough to change their lives so they never need to diet again. They make money when we fall off the wagon, blame our lack of will power, and then have to crawl back to the diet company to try again. Pharmaceutical companies make money when we buy their medicine. They don't have enough financial incentive to keep us healthy enough to never need medicine. People are slowly starting to realize that they can control their health, and that plant-based diets are healthiest for them. Stories have been circulating about diabetics who were able to stop using their insulin medicine completely. We hear about actors, politicians, environmentalists, and athletes who find that a vegan diet can make a real difference in the world, and in their bodies. The world is quickly becoming more veg-curious. The problem is that even after you decide to learn about plant-based diets, it's hard to find all the information in one place. Thank you, truly, so very much for doing the homework for the rest of us. I have wanted to do this for a long time, but having your website and knowledge is extremely helpful. You are helping me to be a better person. Since reading your book, I have learned a lot about legumes and grains, they different kinds, recipes, etc. It was extremely helpful! I use the meal planning page alot and the grocery check off list. I also love the ABCs of animal products. All of those items are really useful!I am really grateful for all the help. There are entire books on factory farms, vegan weight loss, and entire medical research studies on heart disease, diabetes, and many other illnesses. It takes a long time to read all those books, and sometimes you can come out even more confused than you were when you started. Busy people need simple solutions, and direct answers. You don't have time to be laboring through entire books on nutrition. You can't read a whole text on factory farms. And the nutrition advice nowadays is so scattered and confusing, you just can't spend time trying to wade through it and find the facts. I did all the work for you. I read the books and compiled the information to help you. A Fresh New Vegan You is a one-stop shop for information about the vegan diet, and it's in language you can understand. Cathleen, I just want to applaud you on your efforts and let you know how much I enjoyed reading your book, " A Fresh New Vegan You". I personally really connected to a lot you said because my husband is very much a "meat and potatoes" eater and has grown up in the "southern tradition". I have not personally eaten red meat for about three years and his family constantly teases me. I was really nervous about transitioning to Vegan because I was afraid they would just enjoy picking on me way too much. However, your book has given me that extra push and I am excited for this new endeavor and way of life! Thank you so much. Even if you never want to go vegan, you should know how your diet choices can affect your body and the world around you. If you make just a few small changes to improve your health, you will make a difference. And if many people make the same small changes, we can improve the world. The bigger your changes, the bigger the world changes. Read my story below to find out why being a vegetarian wasn't a big enough change for me. I stopped eating meat when I was 12-years old. I had always been an animal lover and my best friend's older sister was a vegetarian, so I thought it was a good idea. Hey, when we're teenagers we decide things based on what other people are doing, right? I went on for another 12 years like that, still eating fish, eggs, and dairy products. In the back of my mind it bothered me that I didn't have a solid reason for not eating meat. Literally one day I just picked up a book on veganism, and I haven't stopped reading since. Very quickly I decided to stop eating all animal products. I transitioned out of all my favorite cheeses and yogurts, and that part was hard. But once I knew all the facts, I realized that not only did I do the right thing at 12-years old, but I wished I had done more. I wished all those years I had been a vegan. The change for me was extraordinary. I always thought I was eating a pretty healthy diet- I stayed away from caffeine and sodas, I didn't eat much dessert, I ate plenty of vegetables and fruits and I exercised. I'd never been on a diet, and it never occurred to me that there was anything wrong with my diet. In fact, I remember feeling that my diet was better than most other people's. Why then did I suddenly lose enough weight to have to get smaller pants? I'd never really gained or lost much weight, even throughout college. Out of nowhere my clothes were like drapes. To me, that meant that my "vegetarian" diet wasn't right for me. It was as though I had dairy products clinging to my insides just waiting for their chance to escape. What I realize now is that I was strongly addicted to cheese, milk, and yogurt. Without them, my body was lighter and more energized. I could sleep better and think more clearly. I remember a friend saying to me at the beach, "You've always been thin, but you look really good right now, what are you doing?" I told her, "I cut out dairy products." She gave me an odd look, like I wasn't telling the whole story. Surely it couldn't be that easy, right? Of course, for me it wasn't just about losing weight. I never went into veganism intending to lose weight, it was just a side effect. I went vegan because I was ready to know the real stories about the farming industry, and I couldn't have been more dismayed at the truth. I wanted to know how climate change was related to diet, and I was shocked that more people aren't told the facts. I also wanted to know if world hunger had anything to do with the diets people eat, and was saddened to know it did. 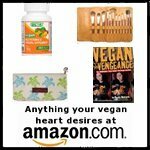 I read nearly fifty books during the first few months of going vegan, and I started Vegan-Nutritionista.com to share the information with other people. I love hearing that my site is helping people with their journeys, but I realized that I am getting a lot of the same questions from the same types of people. After reading youur site I've officialy decided to go vegan! Your site is amazing, I'm going to buy your book asap! The 'New Vegan Ebook' page really had some good info that encouraged me to want to buy your book, & the 'What Do Vegans Eat?' page was also very encouraging. Your personal stories and the personal experience aspect of site was very encouraging. It's nice to hear how other people have made their way to a vegan lifestyle. Thanks once again! I'm on day two, of hopefully a long happy vegan life! Are you against eating animals, but curious about why people take it to the next level and go vegan? Are you a diabetic fed up with daily insulin shots and doctors who don't tell you about a way to cure your disease? Do you really want to be a vegan, but doubt you'll ever be able to give up cheese (or ice cream, or steak)? Are you worried about getting enough protein and vitamin B12? Are you a meat eater who's tired of diets that don't work? Do you want a permanent solution that gives you energy? Have you just become a new vegan and want solid guidance and some data to present to all those concerned loved ones? Are you pregnant and want to know if you can have a safe, healthy pregnancy on a vegan diet? Are you a struggling vegan-- not quite feeling the benefits, and wondering how to balance your diet and stop eating so much vegan junk food? Are you curious about the benefits of soy, and how you can get enough protein? If so, this ebook is for you. I put together "A Fresh New Vegan You" as a one-stop-shop resource for you. You don't need to go through the time-consuming process of reading all those books, I've done it for you. I'm a long-time vegetarian turned vegan, and I wanted to tell you that I love your site. 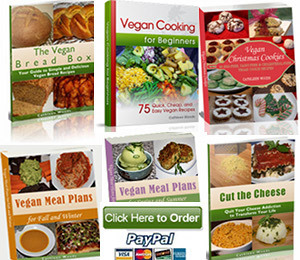 It's full of useful recipes and advice for old-time vegans and vegans just starting out. Plus, it answers all the concerns people have about a vegan diet. Keep up the great work! Does Milk Really Help Prevent Osteoporosis? The China Study; Why Don't Doctors Tell Us About Vegan Diets? Can You Be A True Environmentalist If You Eat Meat? Section 6 - Vegan Nutrition: What Do Vegans Eat? Getting a Vitamin B12 Deficiency? Why Doesn't Everyone Know About Veganism? Health Benefits of Beans and Legumes; What Are Legumes? Organic Foods; "What is certified organic? "; Why are Chemicals Harmful? Is Organic Actually More Expensive? This huge master grocery list includes more than everything you'll ever need to buy at the grocery store. You will not need to buy everything on the list every single week. This provides you with a simple list that allows you to highlight what you need for the week and check it off at the store. This is a must-have for all vegans, new or veteran. You can even pick and choose from this master list to create your own customized list so you can print multiple copies for each week of shopping. Learning to cook dried beans is a great money-saver for new vegans. It also gives you control over what additives you put into your beans. Many beans require different soaking and cooking times, and no matter how many times I've cooked them, I always find myself looking back at my cooking guide to remember how long each cooks. Don't be intimidated into buying only canned beans. The process is really easy and requires no more "cooking" than knowing how to boil water. As with cooking beans, different grains absorb different amounts of water at different speeds. Just like with the bean cooking guide, this is an essential guide to each different bean. Many people aren't really sure what whole grains are, and this guide explains everything you need to know about grains. "A Fresh New Vegan You" is loaded with 182 pages of research on the benefits of a vegan diet and the drawbacks to an animal-based diet. 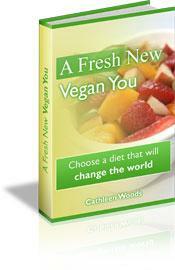 You can access "A Fresh New Vegan You" for only $27 - about the same price you'd pay for one meal at a nice restaurant. If all you do after reading this book is start cooking your own beans and grains, you will get your money's worth. But I'm certain the information in this book will do a lot more for you. I think this guide will inspire you to make a change in your lifestyle to help your health and the health of the world around you. I think you'll find it's the best $27 you've invested in your health this year. 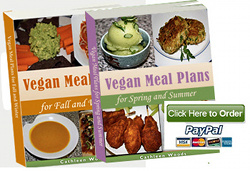 Immediately after your purchase, you can download your ebook to start learning about veganism within minutes. 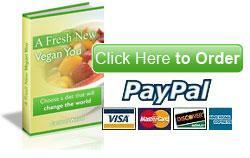 "A Fresh New Vegan You" is in the Adobe PDF file format, which you can download for free. After purchase, you will receive instructions on how to download Adobe and "A Fresh New Vegan You". The eBook comes with a 100% Money-Back Guarantee: If for any reason you're not 100% satisfied with A Fresh New Vegan You, just email me within 8 weeks of your date of purchase - and I'll issue your 100% refund immediately, no questions asked. What have you got to lose? 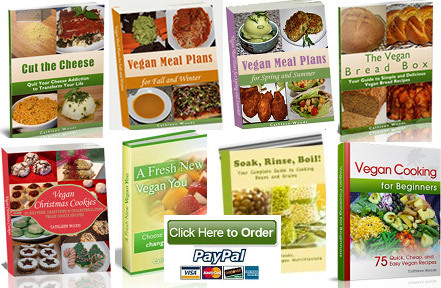 Free Email Support: With your purchase of A Fresh New Vegan You,you'll receive personal email support. You are welcome to ask a question at any time. Secure Payment: Your eBook purchase is 100% safe and secure - and 100% risk-free. Whether you pay with a credit card or PayPal, every transaction is secure. Have an amazing time in your new vegan body with your new, refreshed vegan mind! 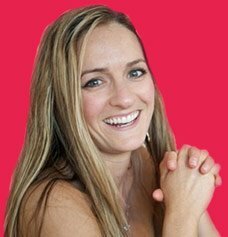 Feel free to email me at cathleen [at] vegan-nutritionista.com with any questions about the A Fresh New Vegan You eBook download process.